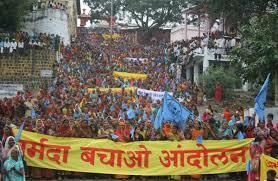 In a major announcement, the Narmada Bachao Andolan (NBA), led by top social activist Medha Patkar, has declared its decision to hold a protest fast (chetavni upvas) from April 27 to 29, 2016 at Bhopal against the Madhya Pradesh government's alleged failure to rehabilitate thousands of Narmada dam oustees. “The time has come again that together we challenge the preparations made by those in power and involved in corruption to drown thousands of families in years old civilization of the Narmada Valley”, said the NBA. Currently lying with the Madhya Pradesh state assembly, the NBA said, refusal to open the report suggests how the government wants to hide corruption by the Narmada Valley Development Authority. “The Jha report has shed light into how many fake registries in rehabilitating the oustees have happened”, the NBA said. “It has to be found out which officials are involved in this, apart from finding out about money and land. Those who are guilty needs to be identified and punished accordingly. Even before we went to the High Court, the displaced people were being sent to jail, which was stopped by the High Court”, the NBA said.